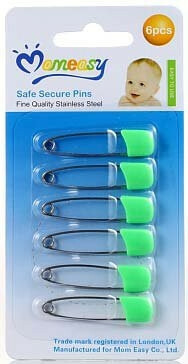 Momeasy Safe Secure Pins 6pk . Used to install the baby's hat or clothes or diapers. Used to install baby bibs, clothes and diapers. Made of stainless steel. Designed to prevent accidental opening. When not in use; - Open pins can be placed in a piece of soap, making use of the next easier. Put it carefully and set your baby's pacifiers in his clothes. Used to give your child comfort.